Most girls dream about their wedding day. The picture perfect scenario of white lace and promises in an idyllic country setting surrounded by happy, noisy, beautifully-clad family and good friends. I never really dreamt of my wedding day. I was more worried about IF and WHO I would marry. At 16, it seemed like I was going to become an old maid. At 18, I thought, maybe not. At 19, I met Louis and I figured - this must be the one!! Two years later, we got married and within 2 weeks, we were off on our road trip. And I mean that literally. For the last 42 years, we have gone by car, boat, plane and train to many countries. Living in some, visiting many. Taking with us our household and our 2 children. The trip has taken me to many places I never thought I would ever reach as I read those Mills and Boon novels pining for the tall dark stranger who would sweep me off my feet. (The tall blond man who finally did is not too bad either!) I have become so much richer in spirit and I would not trade any of the experiences, both good and not-so, for a simpler life. But we do get older. And life no longer is that frenetic race to achieve, to have, to own. I look around our home and look at all our accumulated purchases through the years and think … yes, what were we thinking? Crystal glasses, sterling silver water pitcher, dinner service for 30 ?? For the children, we thought then. Except, they don’t seem to either want or need them. This summer, 2 years before my official retirement and with Louis partially retired, we have decided to go on another road trip. This time, one which we have mapped out ourselves. Hoping there won’t be too many surprises along the away, covering some of the places we have set down on our bucket list. It is our trial run for the day when both of us no longer have to jump out of bed at the sound of the alarm clock and get ready for work. It is for the time when we shall both be home – ALL day, every day. Whew! The thought alone is a bit daunting. When do I have my ME time? I have managed this so well with him working on the days that I don’t. Allowing me to have the girls over for long, chatty (wine-y) lunches or just to indulge myself on a Netflix mini series. Yes, this summer is dress rehearsal time. 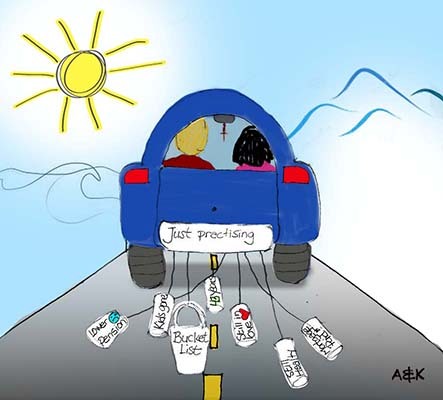 Just the 2 of us on the road, with lots of snacks and some of our favorite CDs tucked into the little box between the front seats right beside the double coffee mug compartment. Our bags are nearly packed and we’re ready to go…. I’ll keep you posted. Every Filipino family has a favorite Adobo recipe. This one is not my mother's. It is Marina's, a dear friend I met in Singapore during the first years of our marital journey. Since then, I have made adobo our own. It is the main dish for nearly all our first time dinner guests; the dish my kids ask for if they have not been home for awhile; the dish I take on long weekend cottage getaways. (I must apologize. Filipinas do not do camping very well). The leftovers make a great sandwich or tortilla wrap for the trip back home. To cook : Brown the chicken & pork pieces in a bit of oil. Set aside. Return the meat into a heavy-bottomed pot, pour the marinade over the meat. Let it boil and then simmer till tender. Do not add water. While simmering, the liquid from the meat and the marinade will create a delicious gravy. Since the pork takes longer to cook, take the chicken out first so that they do not become too soft. Return the chicken to the mixture once the pork is cooked to your liking. Taste the sauce, add more salt or vinegar accordingly. 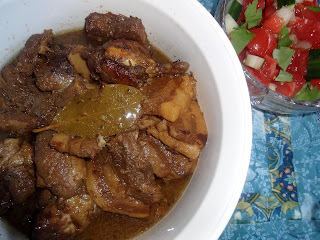 The Adobo can be refrigerated for several days. Or frozen and then defrosted when you have company. Combine - 2 tbsp. corn oil, 1 tsp. vinegar, ¼ tsp. Kikkoman or Korean soy sauce, ¼ tsp. sesame oil. Add salt, chili powder, sugar and pepper according to your taste. Sprinkle the top with freshly toasted sesame seeds. Perfect family recipe for the story. Still need to actually learn to make this.